Maureen Boyle lives in Belfast. She began writing as a child in Sion Mills, County Tyrone, winning a UNESCO medal for a book of poems in 1979 at eighteen. She studied in Trinity in Dublin and did postgraduate work in UEA, UU and in 2005 was awarded the Master’s in Creative Writing at Queen’s University Belfast. 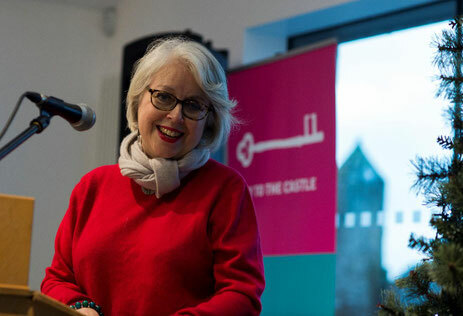 She has won various awards including the Ireland Chair of Poetry Prize in 2007 and the Strokestown International Poetry Prize in the same year. In 2013 she won the Fish Short Memoir Prize. In 2017 she was awarded the Ireland Chair of Poetry’s Inaugural Travel Bursary for work on Anne More, the wife of John Donne. Her debut collection, The Work of a Winter is published by Arlen House Press, Dublin. She taught Creative Writing with the Open University for ten years and teaches English in St Dominic’s Grammar School in Belfast. Q: Your poem, ‘Weather Vane’, is written in the voice (or the imagined voice) of an inmate of a Mother and Baby Home, sent out “on the roof this breezy day, / in the sixth month of my pregnancy” to pick “the moss and lichen... in soft bouquets” from the slates. Can you tell us anything about where this poem came from, so to speak? I’m interested to know if there was a more-than-literary compulsion to set it down on the page, for example – whether the poem’s emotion, as you understand it, includes a political or ethical element that a purely lyric piece might lack. A: This poem I suppose had two sources – one actual and the other more general. Like many people, I was fascinated by the stories of the women in these places and have been since I worked for a summer in the 1980s with some fellow Trinity students working on the 1911 Census in the Public Records’ Office at Smithfield. And some of the census returns were of the big asylums and institutions and there were women who were entered as having come in at 16 years old, but were still there in their 80s and the cause being given as melancholia or moral impurity or some such phrase. I live off the Ormeau Road in Belfast and at the top of the road was one of these institutions and I’m always fascinated by these buildings and the stories they hold. And then finally a friend of ours told us an amazing story of having had a child taken from her in this building in the 1970s, but the key detail was that of being put on the roof to clean the moss off when she was six months pregnant, an image that was so striking and so horrific that I knew I wanted to do something with it. She didn’t remember what it was she was being punished for – the imagined crime of vanity comes from a nun who remembered being punished in a convent for this. And other details – like the writing of the postcards came out of the stories that started to be shared in women’s stories of the homes, while the physical depiction is from my own experience of the cold aridity of a convent/institutional life. The reference to the withering of the hands comes from one of the gnostic gospels. So the poem works as a kind of patchwork of gleaned detail. And yes – I think the poem becomes a site of anger and rage at what was done to women, but through an act of reclamation or giving voice. I think poets who have most influenced me – like Heaney and Paula Meehan – have always given me the sense that the lyric can encompass the political. And it has had another life now since one of my past-pupils, Úna Monaghan, who is an accomplished harpist and composer, has used the poem in a bigger musical piece called ‘What Haven’t We Heard’ on women and the poem is then literally lyric, sung by Kerry singer Pauline Scanlon at the Imbolc Festival in Derry last month. It was incredibly powerful to hear it given this new and different life which somehow extends it. Q: I have a sense (perhaps I’m wrong!) that for you as a writer, and in quite a precise way, the demands and rewards of poetry as a vocation are linked to the private rituals and challenges of religious faith, or spirituality at least. Is there any truth to this, do you think? I noticed that ‘Weather Vane’, for example, is prefaced by a line from the Psalms , “your love, Lord, reaches to heaven / your truth to the skies”, while the title poem from your collection, The Work of a Winter, is written from the perspective of one of the authors of The Annals of the Four Masters, the Franciscan friar Mícheál Ó Cléirigh. “These are my last things”, the poem reads, “my litany of lost / or nearly lost words inflected by home”, which “flit in the dusk”, are “made vivid for a moment, then gone.” Does poetry express a particular kind of faith in the world, and how does this relate for you to religious belief and affiliation per se? A: I am fascinated by religious belief and practice but I’m neither a believer nor a practitioner! If I have a belief it probably is in poetry itself and in literature in a bigger sense, but I like to write about the past. It seems important to at least try to be faithful to an earlier belief system which is sincere. I think it can be tempting, as feminists, for us to give women voices that reflect our own secularism when that would have been inconceivable for earlier women and men. So, for example, the woman at the heart of ‘Weather Vane’ – like so many such women – is still a believer, is still religious, despite the abuse she has suffered. Similarly, I wanted to tell Ó Cléirigh's story because he was a figure I grew up hearing about on family holidays in Rossnowlagh, but a dilemma with him was that the work he was doing was really as an arm of the Counter-Reformation – writing a history of Ireland to make it Catholic back into antiquity. But my own instinct would be that that was the wrong side of the argument to have been on, but I had to be true to how I’d have imagined him, so I concentrated less on theology and more on his personal faith and the quite modern/post-modern idea of him as a collector of stories. I like your phrase about poetry as expressing a ‘faith in the world’ – my faith is humanist, in human creation and endeavour, and the best of religious belief represents human imagination to me rather than anything from beyond us. I was raised Catholic – though I knew I didn’t believe since I was about 11 – but I don’t have the kind of allergy to religion that some of my friends and fellow poets have! I think it gave me an early access to narrative and poetry and myth, and I value those. I remember reading as a child a passage I think by George Steiner on what being raised within a faith brings to the writer... I don’t have children, and I don’t think I could have raised them as Catholics if I had, and yet I’d have worried about them not having the imaginative richness which it gave me. Q: Your poem ‘Katherina Knoblauch’ is based on the painting of the same name by Conrad Faber, currently held in the National Gallery in Dublin. Likewise, your piece ‘Jacinta Painting Under Trees’ responds to a work by the (contemporary) artist, Jacinta O’Reilly – or more precisely, it observes her composition process, and in-so-doing articulates your own exploratory thoughts about art. “When / this painting hangs, will it hold the outside in?”, the poem queries, while noting that “I have never / seen a painter work like this…”. Are painters and poets similar creatures, in your view – aiming to “hold the outside in”, or maybe to give shareable shape and expression to what would otherwise by an inner life alone? Another way of framing that question might be to ask: has an appreciation for or curiosity about painting stimulated your sense of craft as a writer? A: Painting is important to me because I found my way back to writing as an adult through ekphrasis. The ‘Katherina Knoblauch’ poem along with ‘The Magdalene Reading’ were the first two poems I wrote while on a Pushkin summer course at Annaghmakerrig specially for teachers, and I think it was the Irish/Liverpudlian writer Moy Mc Crory who gave us postcards of the paintings. More recently, I’ve spent at least a week in Annaghmakerrig every year, and I find myself sometimes envious of the freedom I see in the way the painters work – especially those like Jacinta who are trying unusual, playful things. Of course there is mutual envy – they often think what we do is equally mysterious, but I do think there can be a great playfulness about painting and I’m often humbled that while I might have one poem at the end of a week – since I write slowly and with a lot of prep before hand – the painter will have a whole studio of work and perhaps paintings over other paintings that haven’t worked. I think painters and poets are similar in the sense of the attention paid and the studied looking at the world and attempting to create a version of it, but one that is personal, filtered through the individual vision. And there is the same sense, yes, of crafting the piece and for me of narrative, of story. I suppose all creative work is giving expression to what would otherwise be the inner life – it has been that for me since I wrote as a teenager, and perhaps that is part of my interest in religious experience which involves a similar going into the self – an interiority, which is then somehow made manifest. Q: You’ve worked as a creative writing lecturer with the Open University, as well as teaching English at secondary level. Can you tell us how your experience in these roles has affected your writing life over the years? Has your time as an educator helped to shape (or to change) your creative interests, for example, or have these tended to be in a state of friction with one another? A: I wrote a lot as a child starting very young and then with a kind of real intensity as a teenager – so I knew this was something I wanted to do, but when I went to Trintiy – to study English and History – like many before me I stopped writing, As the daughter of a teacher I put off going into teaching until I was in my thirties – I worked in Adult Literacy in London; in the Penguin Bookshop in Camden; in the Periodical Room of Senate House; and then finally gave in and did the PGCE, after an abandoned PhD, only to find that I loved teaching. For years there was a conflict, because although I loved it, I spent a lot of time resenting the energy it took. But I’m philosophical about it now. I’ve just given up the OU work since, although I loved it, I did find it very intense and all-consuming and almost impossible to do only the kind of support we were required to do. Because the course was online I wanted to be genuinely available to people, and it can be a very intense and intimate experience sharing people’s first writing like that. In terms of school teaching I think it just drains all of your creative energy – if you’re doing it properly – but then it provides inspiration too. The texts I’ve worked on at A Level provide ideas for writing – like the poem that attempts to imagine the gap of time at the heart of The Winter’s Tale came out of the close reading that teaching leads to of that play, or the work I’m doing now – for a Travel Bursary last year from the Ireland Chair of Poetry, which allowed me to visit the Isle of Wight where John Donne’s wife, Anne More, spent time in 1611/12 when Donne went off to Europe, leaving her with ‘Valediction Forbidding Mourning’ as recompense! The desire to try to write about More, about whom almost nothing survives save Donne’s beautiful love poems, came out of teaching Donne. So it can be inspiring and I use writing in all of my teaching and get a lot out of fostering children’s creativity. Q: Finally, congratulations on the publication of your new book! Can you give us an inkling of what the process of putting it together (converting your manuscript into a collection) was like? A: Thank you so much. I am still unused to people’s generosity in reading the book and I appreciate it very much. The process of creating the book wasn’t easy because I’d taken so long to write it – about sixteen years – the same gap that The Winter’s Tale covers, as some of my fellow Arlen House women point out! This meant there were a lot of poems from very different times to marry and find a way to make whole and my lines had become very long in that time – and in the book’s first arrangement, which was largely chronological, there was a sense of it being lopsided really. So I had to do some more radical work on reordering and I had great editorial help with this from some readers – particularly my friend Katie Donovan who was really generous in looking at the shape of the book and giving suggestions. I didn’t take all of her suggestions, but just having someone else suggest a different order was liberating. And my editor at Arlen House, Alan Hayes, was really helpful here too since I think it was he who suggested the book-ending of the collection using the two long sequences – ‘Incunabula’ and ‘The Work of a Winter’. I’d never have thought I could put a long sequence as an opening but actually it really works and gives the book a strength, I think, as well as a kind of chronology because the origins of lots of the later poems are in that opening poem. I have friends who left a lot of their early poems out when they eventually produced their first books, and I didn’t want to do that – I wanted to allow those poems a place in the work – so I left very little out. We talked about the possibility of making two books or at least keeping some back for a second book, but I’d waited so long to publish that I needed to get them out there so as to be free to move on. I’m happy with the result.